ESU QB Bruce Campbell finished with 375 yards and 2 touchdowns in Saturday’s season finale. The East Stroudsburg University Warriors’ football team lost to the PSAC West co-champion Gannon Golden Knights 66-41 in the season finale last Saturday afternoon in Erie, Pa. 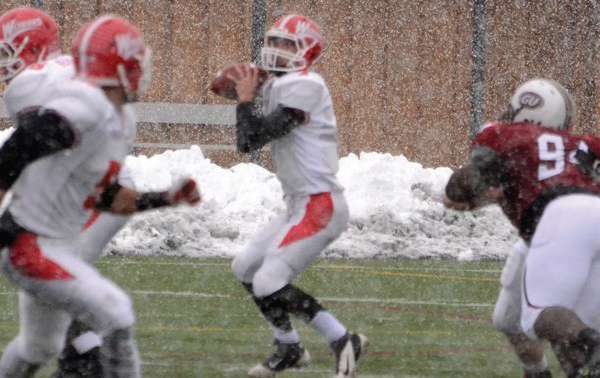 Despite falling snow and gusty winds, the game was a high-scoring affair. The Golden Knights used multiple record-setting performances to defeat ESU. Gannon (9-2), relied on a heavy running game en route to their win over ESU, led by running back Brock Jones. Jones gouged the Warriors’ defense for 321 rushing yards, the most ESU has ever allowed and a Gannon school record. Jones also found the end zone twice. Jones ripped off a pair of runs from 12-yards and 60-yards out for his two touchdowns in the first quarter to highlight a 21-point opening quarter for the Golden Knights. ESU redshirt sophomore tailback Robert Healy scored on a 1-yard touchdown to make it 21-7 at the end of the first quarter. However, ESU’s defense couldn’t keep Gannon’s offense out of the end zone in the second quarter and were outscored 21-7 in consecutive quarters. ESU’s only score in the second quarter came when Healy added his second touchdown of the game, a 13-yard scamper. After the first half, ESU’s defense allowed 453 yards of offense, including a one-play 82-yard passing touchdown to Gannon wide receiver Jesstin Hamm from quarterback Liam Nadler to make the deficit more daunting for ESU at the half, 42-14. In the second half, Gannon’s offense continued to have its way with ESU’s defense by scoring 17 more points in the third quarter. The Warriors’ lone offense in the quarter came on a 1-yard Derrick Dyer touchdown run to make it 59-20. In the fourth quarter, ESU’s offense came to life, but it was too little, too late. Dyer added his second 1-yard scoring run, and redshirt sophomore quarterback Bruce Campbell connected with redshirt junior wide receiver Jon Schnaars on a 33-yard touchdown pass to make it 59-34. Both teams would exchange touchdowns in the last four minutes of the game. ESU senior wide receiver Ray Dominguez found the end zone from 27-yards out to give the game its final score, 66-41. Campbell finished the game 22-for-36 for 375 yards and two touchdowns in place of starting quarterback Matt Soltes, who has been injured for the last three weeks. In total, Campbell connected with seven different receivers in the game. Senior wide receiver Dusty Reed led the team with eight receptions for 145 yards, including a 51-yard reception. Schnaars continued to show his prowess for finding the end zone. The wideout was on the receiving end of five passes from Campbell for 119 yards with his PSAC leading 14th touchdown, which extended his streak to seven consecutive games with a score. Defensively, ESU allowed Gannon to shatter multiple Golden Knights school records including most points in the first half (42), single-game and single-season scoring records along with single-season all-time total yards (672). The Warriors were led on defense by redshirt senior defensive lineman Bryan Thomson with 10 tackles. Linebacker Kaje Cowans had seven tackles, including one for a loss, a sack and a forced fumble. ESU finished the 2014 campaign with a 6-5 overall record and strung together a 5-game winning streak with wins over Edinboro, Lock Haven, Shippensburg, Cheyney and Millersville. The final four games resulted in the opposite streak with four straight losses to end the season. Head coach Denny Douds completed his 41st year as head coach of ESU and has 250 wins in his career, third in Division II history. He has coached 429 career games, ninth most in NCAA history.